Full details of Apple’s TV series lineup is expected to be unveiled at an event on March 25. The Morning Show, starring Carell, Aniston and Reese Witherspoon, is expected to be one of the first original Apple TV shows available. Apple has already committed to two season of The Morning Show. It’s described as a comedy that goes behind the scenes of a morning news show. Aniston plays one of the main morning show hosts. Carell plays Mitch Kessler, “a morning show anchor who is struggling to maintain relevance in a changing media landscape.” Aniston and Witherspoon are reportedly being paid $1.1M per episode for executive-producing and starring in the two-season series. 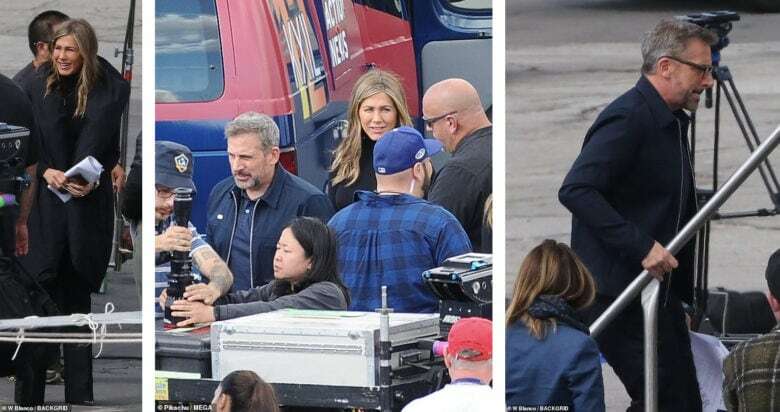 The Daily Mail reports that the duo was spotted filming in downtown Los Angeles. They were both filming scenes by a van marked KXIL 12 Action News. Aniston was wearing a Steve Jobs-style outfit with a flared black turtle neck and matching pants. The series is directed by Mimi Leder.